PRESS RELEASE: Keating Law Offices, P.C. filed a lawsuit against a motorist and his corporate employer on behalf of a Chicago bicyclist who sustained significant injuries after attempting to avoid a collision with the corporate vehicle in the new protected bike lane on Kinzie Street in Chicago, Illinois. Attorney Michael Keating filed the lawsuit on Friday, September 28, 2012 in the Circuit Court of Cook County's Law Division. The lawsuit is believed to be the first lawsuit involving a bicycle accident that occurred on Chicago's highly praised Kinzie Street protected bike lane. The bike lane on Kinzie Street, which runs approximately a half mile between Milwaukee Avenue and Wells Street, was the first protected bike lane installed in Chicago as a part of Mayor Rahm Emanuel's plan to install 25 miles of protected bike lanes each year. According to the City of Chicago, the protected lane features three main elements: a marked bike lane adjacent to the curb in each direction; a buffered area with flexible marker posts; and a parking lane for automobiles. Green paint and pavement markings depicting a bicycle help further define the lane for both motorists and bicyclists. The bicycle accident occurred on November 1, 2011 on Kinzie Street just north of the Merchandise Mart. The lawsuit alleges that the bicyclist was traveling eastbound on the bike lane on Kinzie Street when an motorist turned his 2008 Dodge SUV across the protected bike lane. As a result, the bicyclist was forced to swerve to avoid the oncoming SUV and crashed into a concrete wall. The bicyclist suffered significant injuries, including a fractured clavicle (collarbone) that required extensive medical care. The complaint alleges that the motorist carelessly and improperly drove across the protected bike lane without first allowing the bicyclist to safely clear as required by Sections 9-16-020 and 9-40-060 of the Chicago Municipal Code. Keating Law Offices is the premiere personal injury law firm in Chicago that devotes part of its practice to representing victims of bicycle accidents. The firm's attorneys have represented numerous victims of bicycle accidents and bike crashes in Chicago, the suburbs, and throughout Illinois. 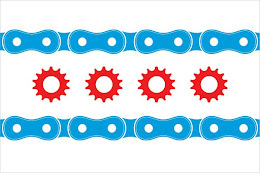 The firm practices in every corner of the State of Illinois and its attorneys are committed to representing victims of bicycle accidents everywhere in Illinois. Keating Law Offices was founded by attorney Michael S. Keating who is currently the Vice Chair of the Bicycle Litigation Committee of the national American Association for Justice.